Raleigh Edward Colston, b. Paris, France on October 31, 1825. Adopted son of Dr. Raleigh Edward Colston (1796-1881) and his wife Maria Theresa, Duchess of Valmey (ca. 1775-1845). The young Colston was sent to the United States in 1842, in care of his uncle Edward Colston of Berkeley Co. [West] Virginia, to complete his education. Entered VMI on July 8, 1843; was graduated on July 4, 1846, standing 4th in a class of 14. Louise Meriwether Bowyer of "Thorn Hill," Rockbridge Co., Virginia. Two daughters: Mary Frances and Louise Elizabeth. Professor of French at VMI from 1846 until outbreak of war. In November 1859, he accompanied a contingent of VMI cadets assigned to guard duty at the execution of abolitionist John Brown. Commissioned Col. 16th Virginia Infantry Regiment; appointed Brigadier General in December 1861and led brigade under Longstreet in the Peninsula; given brigade under Jackson in April 1863 and commanded a division at Chancellorsville; served under Beauregard in defense of Petersburg in 1864; in command at Lynchburg at end of war. Established military school in North Carolina; Colonel Egyptian army, 1873-1879; War Dept. clerk, 1882-1894; died July 29, 1896, at Soldiers' Home, Richmond, VA; buried Hollywood Cemetery, Richmond. Gen. Raleigh Colston died at Lee Camp Soldiers' Home, Richmond. Va., aged 71 years, yesterday. 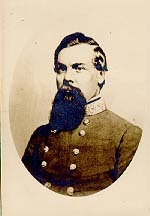 He was a professor at the Virginia Military Institute at the breaking out of the war, entered the Confederate service, and was in command of the Department of Lynchburg when the war ended. For some years after the war, he was in the service of the Khedive of Egypt, and made an expedition into the Soudan afterward. Until incapacitated for work, he held a department position in Washington. Recommended Reading: Battles and Leaders of the Civil War, Volume 6 (Battles & Leaders of the Civil War) (632 pages) (University of Illinois Press). Description: Sifting carefully through reports from newspapers, magazines, personal memoirs, and letters, Peter Cozzens' Volume 6 brings readers more of the best first-person accounts of marches, encampments, skirmishes, and full-blown battles, as seen by participants on both sides of the conflict. Continued below.